We may be guilty of taking for granted our freedom of conscience, though we see it being eroded little by little. Christians in China do not have the expectation of such freedom. Lest we are lured into the dreamy happiness of a Hallmark Christmas movie, the birth of Christ is more than platitudes found in a greeting card – and following Him actually cost something to those who know Him and are known by Him. In some cases, it costs everything. Attached is a letter written by an elder of a Chinese Church who’s profound insight in response to persecution is to focus on how to live like Christ. He is not reduced to mere rebellion or politics, but is exalted to living with hope and faith in times of oppression. Read it and be prayerful. Read it an be instructed. Over 100 members of Early Rain Covenant Church in Chengdu, China, were arrested starting on Sunday, December 9, through Monday, December 10. Authorities arrested pastors, elders, deacons, and congregants, at times using violent means. Some of those arrested have been released, others are being monitored closely, and still others have not been heard from and are unlocated. 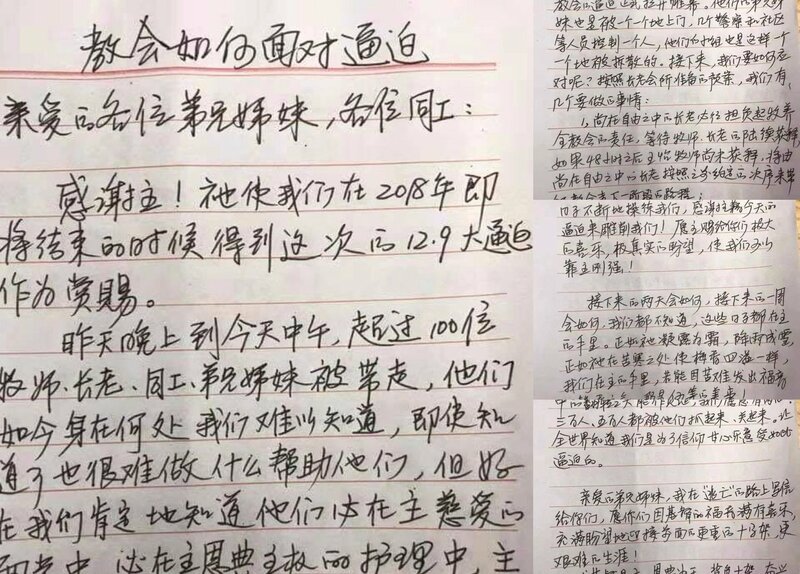 Li Yingqiang (李英强), the last elder of Early Rain Covenant Church to be arrested, wrote this letter to the church just a few hours before being found in his hideout and arrested. In it, he describes the church’s plan for facing this persecution in the following days, including where to worship next Sunday. (Credit Brent Pinkall for the translation of this letter). Thank the Lord! Just as the year 2018 is about to end God has given us a reward in the form of this large-scale persecution that arrived on December 9. Since yesterday evening until noon today, over 100 pastors, elders, staff, brothers and sisters have been taken away. As of now we still do not know where they all are, and even if we did know it would be difficult for us to help them. But, thankfully, we know for certain that the Lord’s loving face is shining upon them. They are within the gracious, sovereign providence of the Lord. He will be with them in the midst of their chains and trials. Thank the Lord for being with us in this trial. Thank the Lord for cultivating us according to his true Word! Thank the Lord for training us through these days of hardship! Thank the Lord for sculpting us through today’s persecution! May the Lord give us great joy and true hope and make us strong through reliance on him. What these next two days or next few weeks hold we do not know. These days are in the hands of the Lord. Just as he turns the dew into frost and the rain into snow, just as he makes the fragrance of the plum blossom waft across the bitter cold, we are in the hands of the Lord. How wonderful it would be if, because of this suffering, we might be able to give off the sweet fragrance of the gospel! Beloved brothers and sisters, I’m afraid this “great persecution” will become the status quo for us in the future. I don’t know if you know this, but three years ago on December 9, persecution was officially unleashed against Living Stone Church in Guiyang. Police also went to the homes of those brothers and sisters one at a time. They would use multiple police officers and community workers to control just one person. Their small groups were also broken up one by one. How should we respond to these things in the days to come? According to the contingency plan prepared by our session of elders, there are a few things we must do. 1. Those elders who are still free must take up the responsibility of pastoring the whole church, waiting for the pastor and elders to be released. If Pastor Wang Yi is not released within 48 hours, those elders who are still free must lead the church down the next stretch according to the order decided on previously. 2. Regardless, Early Rain Covenant Church must not alter the statement of faith and the path of openness that it has proclaimed publicly in the past. And we will not alter our previous stance on the relationship between church and state (正教分立) or our beautiful spiritual inheritance from the Chinese house church of walking the path of the cross. We will not register with the Religious Affairs Bureau; much less will we join the Three-Self Church. 3. We will not easily relinquish our church building and retreat to our small groups. Regardless of who is leading the church, they must try to return to the church building that God has given us. Neither paper seals nor arrests should hinder our determination to worship in our church sanctuary. Unless all elders, preachers, and seminary students able to lead public worship and the preaching of God’s word lose their freedom, we will not retreat to small groups. If we cannot enter the church building, we will rent another place. If there is no place indoors where we can worship, we will begin worshiping outdoors. 4. Meeting in small groups is our last resort. If there is even a very small possibility of worshiping together as a whole church, we will not retreat to small groups. But if we must meet in small groups and encounter opposition while doing so, we are willing to pay an even greater price to bear witness to the great work of the gospel in our lives. We are willing to have 200, 300, or 500 people arrested and imprisoned. May the whole world know that we are joyfully willing to receive this persecution for the sake of our faith. “Christ is Lord. Grace is King. Bear the cross. Keep the faith.” This is the vision Early Rain Covenant Church received from the Lord. May we all obtain it, cherish it, put it into practice, and live it out! May the birth of Christ lead you to the One to made us for Himself. May you know more enigma than dogma in 2019.